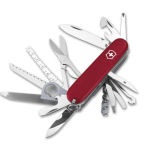 A pocket knife is perhaps the most useful portable tool ever invented. These handy knives are perfect for cutting open packages and removing clothing tags. Simply put, pocket knives are perpetually practical. Though the utility of a pocket knife is its most important feature, these tools can be stylish as well. Gone are the days of simple wooden or ivory-toned pocket knives. Today, the pocket knife market offers buyers a wide variety of colorful and creative knife choices. Are you looking for a new pocket knife for yourself, a family member, or a friend? Check out our favorite stylish and unique pocket knives below! This extra-affordable pocket knife keychain is perfect for women looking for an easy-to-use utility tool. This compact knife comes with folding scissors and a bottle opener as well, all craftily hidden in a simple circular pink keychain. This keychain is ideal for purses and handbags, and ensures that you’ll never have to dig through your bag looking for your knife again. 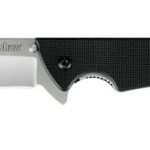 Available for under $5, this is a great simple pocket knife for taking on the go. If you’re looking for a rugged, edgy pocket knife, look no further than this 8″ tactical pocket knife by Wartech. The knife, which comes in red, green, and blue varieties, has a masculine handle covered in engraved skulls and marijuana leaves, lending the knife an intimidating look. 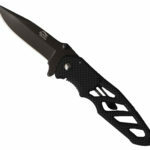 The knife also comes with a stylish black blade, which includes a flame pattern as well. This knife screams “tough,” and you’re sure to feel powerful when using it. This small pocket knife is equally suited to the needs of men and women alike. This knife’s 1.5″ blade is hidden within a bronze-finished house key, hiding it perfectly within your household keychain! This “key” even has a hole in it, making it easy to hang on lanyards and necklaces, too. The best part about this knife is its subtlety. You will always feel safe and prepared with this ingenious pocket knife in your hand. This awesome and affordable 5″ knife is cleverly camouflaged in a handle that looks just like a real revolver gun. With this pocket knife in your holster, you’ll practically feel like an outlaw from the “Wild West.” This tough and intimidating knife has an assisted action opening feature and a well-made stainless steel blade. A manly nylon “holster” is included for free with the purchase of your new blade. All in all, this is one of the most robust and stylish pocket knives on the market. If you’re looking for a pocket knife that you can throw around your neck and carry with you, a bear claw style pocket knife chain necklace just might be for you. 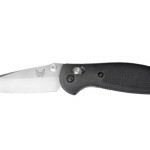 This knife comes with a small yet practical 1.25″ blade sheathed in a real bone handle. If you’re looking for something more colorful, consider choosing an aqua-dyed bone sheathing, which resembles a turquoise stone, or a mother of pearl sheath. This Etsy seller offers many such unique chained pocket knives, all of which are sure to draw eyes to your new blade. If you’re looking for knife that’s practical as well as eye-catching, be sure to consider these stunning chained knives. The incredible knives offered by Sana Cutlery, including the knife featured here, are truly awe-inspiring. With medium-sized blades roughly 3″ long, these knives are heavy-duty while remaining compact and portable. Most notable, however, is the vibrant coloration of these knives’ blades. The steel blades of these knives are heat-treated at a very high temperature before a titanium coating is applied. The end result is a permanently iridescent blade that shines with all the vibrancy of the rainbow. Each knife produced by Sana Cutlery is 100% unique, with distinct carvings applied to their camel bone handles. If you’re looking for a high-end knife that will make your friends jealous, consider picking up one of these beautifully vibrant Damascus Steel blades. If you’re looking for a truly one-of-a-kind pocket knife, look no further than this quirky, fun, peanut-shaped pocket knife! Whether you’re a peanut lover or allergic to the real thing, this golden peanut knife is a charming sight to behold. The blade comes on a long 24″ chain as well, making it easy to carry in your pocket or wear around your neck. Regardless of your age or gender, this pocket knife is sure to become a treasured keepsake. Though many pocket knives feature very simple designs, there are a number of more unique knives hitting the market each week. If you’re looking for a new pocket knife, be sure to check out these unique blades today!